Yesterday I shared highlights from The Blog Societies Conference 2018, so if you missed that post head there first to make sense of this one! Today, I’m sharing the biggest blogging tips I learned from TBScon 2018. 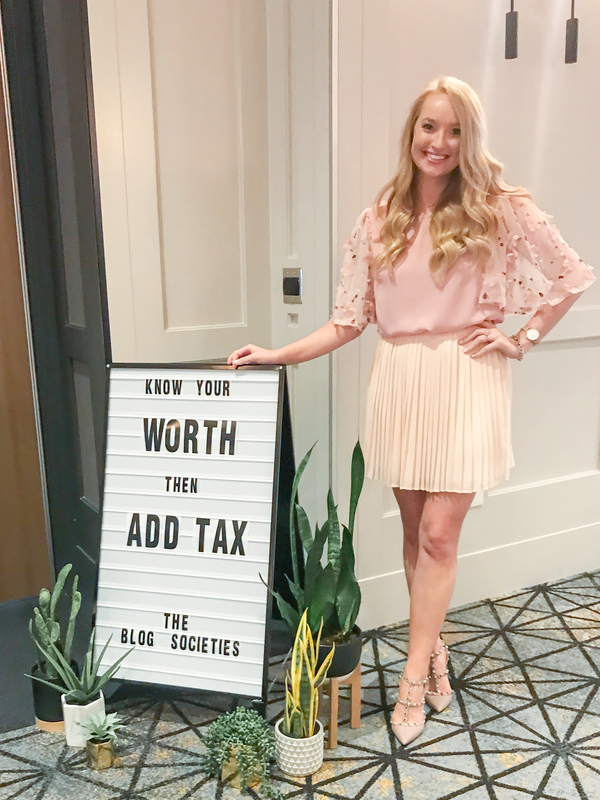 If you’re a blogger wanting to better your business, or you just enjoy reading blogs and want to see behind the scenes, keep scrolling to read about what I learned from #TBScon. Full outfit details can be found here! Just because it’s old content doesn’t mean it’s still not relevant! Lindsey stressed the importance of updating old but good content with updated photography and stronger SEO to make your content work harder for you. After the conference, I spent some time updating SEO to my popular posts before I switched to WordPress and I have already noticed an improvement in my traffic to those posts! The main reason founders Cathy and Jessica started The Blog Societies was to form a supportive network and connect friends in the blogging industry. I’m not sure why it took me 4 years to realize I can’t do this alone, but now that I met some of my own blogging friends I wish I had sooner! Don’t be afraid to reach out and start conversations with girls who inspire you. Since the conference, I have stayed in touch with new friends and we have kept each other motivated. You can’t please everyone you come across on social media, and you shouldn’t! We all have different opinions, fashion taste, and advice to offer. I learned that 65% of users don’t scroll down on your content, say what?! I will definitely be revamping my mobile layout and optimizing my “above the fold” content after hearing this. And read every sentence, even if the contract is 15 pages! Ashlee Hightower from Contracts for Creatives taught us key terms to watch out for when reading contracts and provided a helpful template to create our own. Always be as specific as possible in the contract and look for photography usage rights before signing. Especially when it comes to exclusivity when working with brands. There’s no industry standard when it comes to setting your rates for the content you create. Really sit down and think about the value you can give big name brands, even as a small blogger! Speaking of tax, always consider the taxes you’ll be paying when setting your rates with brands and set aside about 30% for when that time comes. I didn’t get the chance to take the photography course, but I heard through the grapevine about the live feature on iPhone. When taking live photos, you get 16 shots in one. This is especially helpful when trying to get candid shots or when a less experienced photographer is taking your photo. Another takeaway from Grace was to create a Facebook group since they have higher priority in the Facebook algorithm. Avoid using them as self-promotion for your content and focus on creating an online community of like-minded readers. People crave community, especially at my age when your career and kids become a higher priority than your social life. You can join my private, girls only Facebook group here! Feel free to ask for advice, recommendations, and connect with others in the group! Alicia Chew shared how to break into travel blogging, starting with your own city! I’m not sure why I never thought of my city as a travel destination, but it makes sense. Be an expert about your own city first! Most people are looking for weekend getaways within driving distance to home. Although I don’t want my blog to focus solely on travel content, I do want to share more lifestyle and travel content here and on my Youtube channel in the future. I always disclose gifted or sponsored content in my captions and posts, but I never thought about needing to disclose in stories via text in case the viewer doesn’t have their volume turned on. Brittany Stephens from Lawer Lookbook provided invaluable insights to keep you on the good side of the FTC. If you’re not familiar with the FTC guidelines, it is the Federal Trade Commision that sets rules and regulations to protect consumers from unfair business practices. That’s why you see #ad or #sponsored in collaborative posts and it should ALWAYS be at the beginning of the post. I hope you found these 10 Lessons I learned from The Blog Societies Conference 2018 helpful! My to-do list after the conference is a mile long and I’m excited to hit the ground running. Haha it’s because of their engagement rates! I actually enjoy Facebook more now that I’m in groups because I actually learn on the platform!